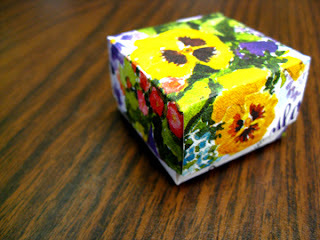 This is an addictive, adorable, eco-friendly project passed down from my mother: Greeting Card Gift Boxes. These are a great size to put in a single homemade candy or chocolate, a piece of jewelry, or a small trinket. The benefits of this project is that it requires zero math and only one measurement, plus, it uses up beautiful cards you've received but won't display anymore. Easy, pretty, and green, how great is that? Chop the extra off your card so it is now a square card. Cut up the seam of the card so you have two squares, front and back. Trim a little off two sides of the back piece of the card, if the card was small do 1/8 (ish), if it was larger, do 1/4 (ish). You don't need to measure, just make sure it's sorta even on both sides or your box will turn out wonky. Take your pen or pencil and straightedge and mark an "X" on the back of the front piece of the card, connecting the opposite corners. 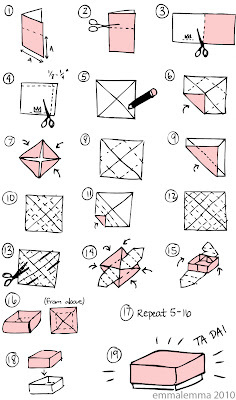 Take a corner and bring it up to the center of the "X", fold and crease. Take a corner and bring it up so that its crease matches up with the perpendicular "\" (leg) of the "X", the point should meet up with the crease on the opposite corner. Fold and crease. Unfold, and repeat for all corners. Take a corner and fold it up so that the point meets the first crease you made in that corner, fold and crease. Repeat for all corners and unfold. Your card should look sort of like the picture. SCISSORS STEP! (If you mess this up there is no fixing it, so be careful!) cut a notch on both sides of one of the "/". Only cut as far as the crease just before the other "\". Repeat on the OPPOSITE corner. THEN STOP CUTTING. Nothing should get cut off in this step, only make 4 notches. Look at the pic for more info (the cut lines are darker than the others). Fold in the corners that you DID NOT notch so that they meet in the middle. There will be little triangular wings on the side, fold those in too so that your card looks like the pic (you might have to hold the flappies down, they might want to pop up in this step). 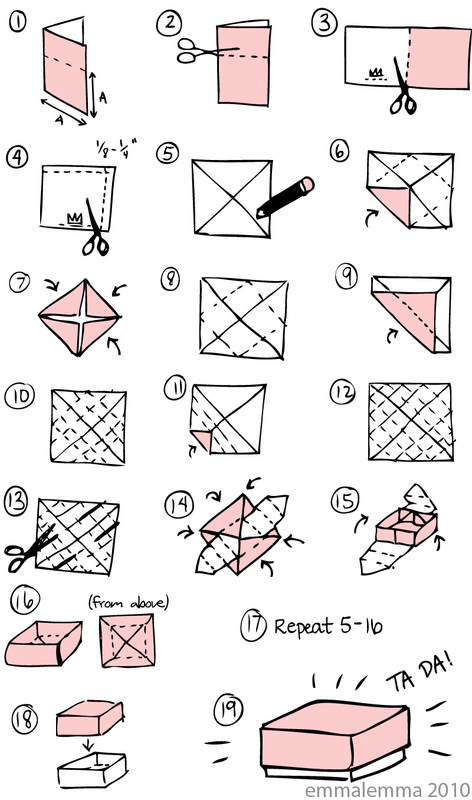 Now take the folded corners you just made and bring them up and fold the wings in to make a box-like shape. Your notched corners will still be flying free right now. I know that this sounds complicated at first, but once you figure it out, the whole process will take you about 5 minutes total. It's super addictive, you'll be making zillions! I'll post my collection here soon!